After John Sullivan experienced the benefits of a Choline C-11 PET scan when he had a recurrence of prostate cancer, he and his fiancée, Sheri Butler, were motivated to become benefactors and advocates for the expansion of Mayo Clinic's Florida campus. The future is clear for John Sullivan of Ocala, Florida, and his fiancée, Sheri Butler. The couple plans to travel and enjoy retirement with their five children and nine grandchildren. They will run for as long as their knees can hold them. And they will live without fear of John's prostate cancer. Not so long ago, they couldn't see a future without that fear. In 2013, more than 10 years after an initial cancer diagnosis and surgery to remove his prostate, John's cancer came back. At first, John says his reaction was, "Here we go again." But that gave way quickly to feelings of uncertainty and dread. "My local physician recommended hormone therapy and radiation of my prostate bed," John says. "I was concerned about side effects, and it wasn't clear that I had any cancer in the prostate bed. Sheri and I really felt this was going to overwhelm us." That's when Sheri contacted a friend who is a physician. "I knew we needed an alternative, and my friend said, 'You need to get up to Mayo Clinic in Jacksonville.'" It was 4 p.m. on a Friday when John and Sheri called the clinic's appointment line. They were able to secure an appointment for the following week with medical oncologist Winston Tan, M.D. "During that first meeting, Dr. Tan did what he continues to do today," John says. "He asked me about my interests and goals, and served as a discussion partner. I told him, 'I'm 65. My prostate cancer has returned, and if I can get 15 more years, I'll be a happy guy.' He said that shouldn't be a problem." "Based on our studies, our Choline C-11 test can see cancer in the body seven years before any other form of imaging." — Eugene Kwon, M.D. With Sheri by his side, John listened to Dr. Tan discuss advances and options for treatment of prostate cancer, including a relatively new imaging test for prostate cancer at Mayo Clinic's Rochester campus, known as Choline C-11 PET scanning. 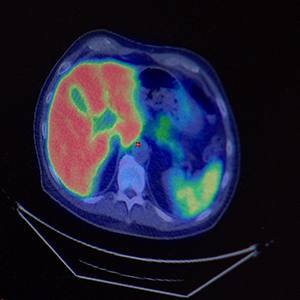 Invented by Mayo Clinic in 2012, the test uses a radioactive form of the vitamin choline and positron emission tomography, or PET, scanning. "Choline C-11 gets eaten up very quickly by prostate cancer," says Eugene Kwon, M.D., a Mayo Clinic urologist who created the test with radiologist Val Lowe, M.D., and many other Mayo staff members. "When the prostate cancer cells take up the choline, they emit a positron, which is detected by PET. Based on our studies, our Choline C-11 test can see cancer in the body seven years before any other form of imaging." For the next two years, John was stable, though he had his prostate specific antigen, often called PSA, checked every six months. In late 2015, John's PSA level began rising. Conventional imaging tests showed signs of bone deterioration in his pelvis. It was time for John to head north to Minnesota for the Choline C-11 test. "John wants to be as aggressive as possible, and the Choline C-11 scan gives us the information we need to support that kind of approach," Dr. Tan says. "I can remember when the call came confirming I had an appointment," John says. "It was Jan. 6, 2016, and it was like, 'Hallelujah, we're going to have this done.'" 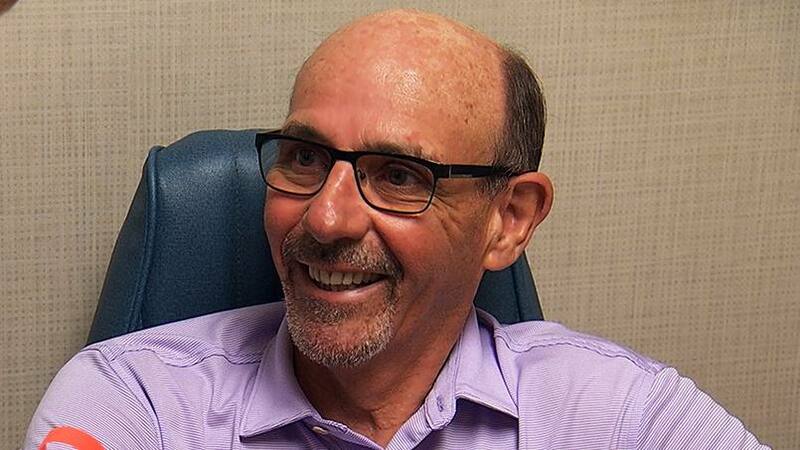 After his Choline C-11 scan, John had a clearer picture of his condition and a precise treatment plan. The test pinpointed a small area of prostate cancer inside John's pelvis that could be treated with cryoablation. Cryoablation freezes cancer cells and often kills them with less severe side effects than those typically associated with radiation therapy. "The test confirmed things without a shadow of a doubt, and we had the confidence we needed to make a decision," John says. "We moved quickly. We saw a radiologist, learned about the cryoablation, and had that done during the same trip." Since then, John has run a half-marathon down the Las Vegas strip and enjoyed everyday adventures with Sheri and their families. Due to the nature of prostate cancer, he continues to see Dr. Tan and Dr. Kwon for ongoing monitoring. John says he is confident in the team-based approach that defines Mayo Clinic's care. "I feel great," he says. "I know I have strong doctors in all corners who will work together when something needs to be done." The future appears bright for John and Sheri. They're looking forward to more time with their kids and grandkids — and to their wedding, which they are planning for 2018. Their future also includes the expansion of Mayo Clinic's Florida campus. In 2016, Mayo Clinic announced a bold plan to grow the campus. It will add more than 400,000 square feet of space; recruit more world-renowned physicians to the staff; and bring innovative technologies, including a cyclotron that will generate particles for Choline C-11 scanning and other breakthrough imaging tests. The total cost of the expansion is more than $300 million, and Mayo Clinic has a $100 million fundraising goal to bring its benefits to patients as soon as possible. John and Sheri have joined the cause, both as benefactors and advocates for Mayo Clinic. "I'm excited about what the expansion will mean for patients," John says. "Choline C-11 and the other types of imaging tests will give physicians a better path forward and give patients the information they need to make better choices about their care." But more than technology, John and Sheri say it's the people and culture at Mayo Clinic that inspire them to give. "Mayo Clinic treats the whole patient, and as part of that, they include the families of patients," Sheri says. "It's a different culture. We're excited that it's growing, and we want to help." The couple also now has longer-range plans than those John first articulated to Dr. Tan. "Our youngest grandchild is 3 years old," Sheri says. "My hope is that John will get to see him graduate from high school." 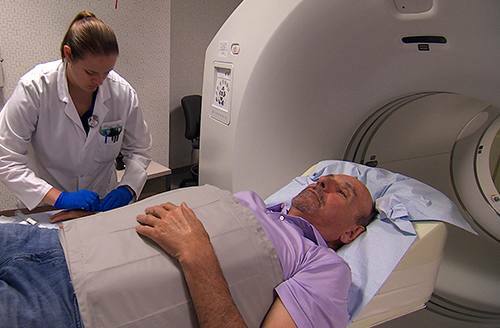 Investigate prostate cancer diagnosis and treatment options at Mayo Clinic. Support cancer research at Mayo Clinic and consider making a gift.